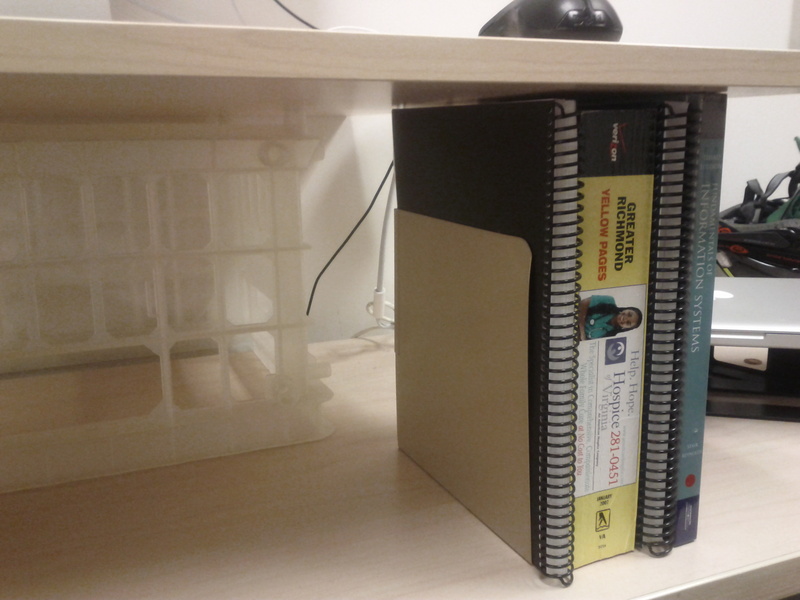 I got crafty last week and decided to see if I could make a standing desk from found materials around my office. The result was pretty cool, and so far I’m enjoying testing it out. …and that’s it. I don’t think this will be a forever desk, but it’s fun to try out for now. I do know I will need an anti-fatigue mat to stand on, which apparently is a gamechanger. Down the road I’m hoping we’ll get pneumatic, easily-adjustable desks a la GeekDesk. 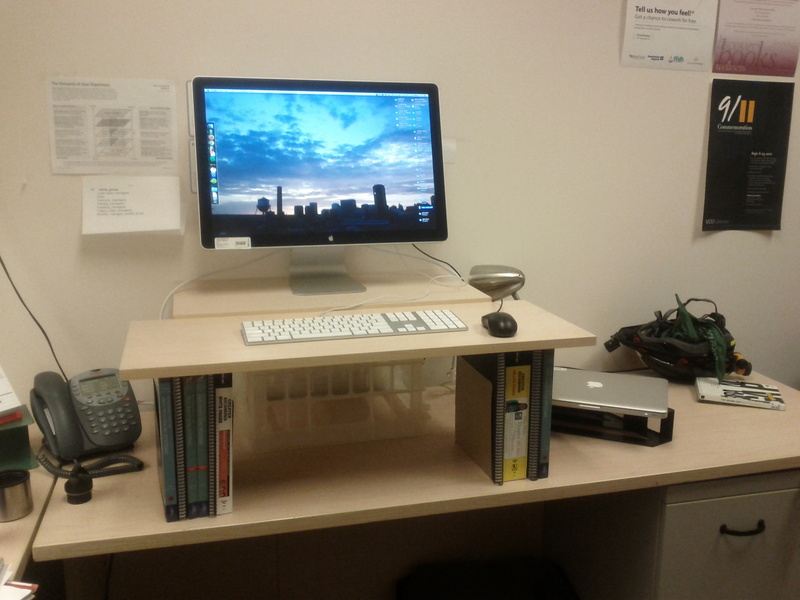 In the short term, though, this is a good way to figure out if a standing desk will work for me. Update 4/17: I’m still standing. The first few weeks were rough – the concrete floors were not very forgiving and I was having pain in my feet and back at the end of most days. 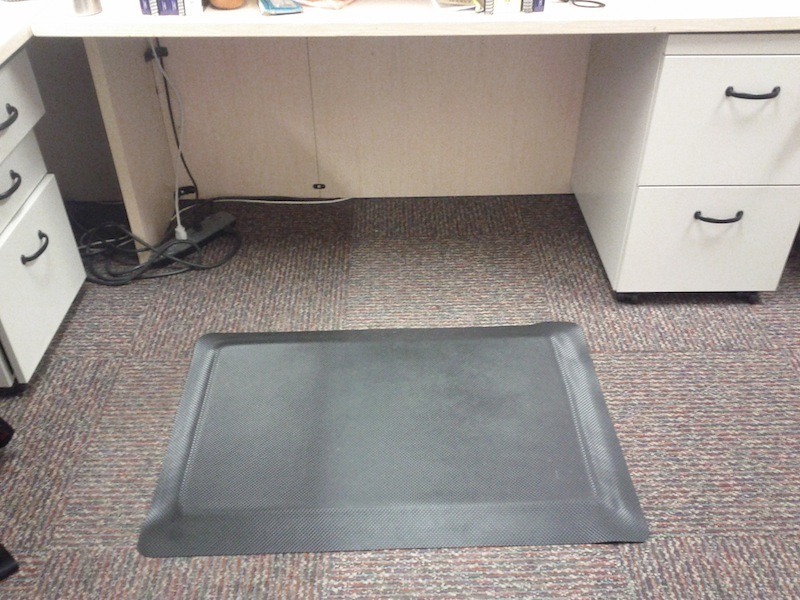 In mid-March I got an anti-fatigue mat (a 2′ x 3′, 7/8″ thick mat from SitBetter) that has made all the difference. The mat’s super-comfy and supports standing for long periods of time. I’ve been standing at my desk all day and only sitting for meetings. On days without meetings I am standing to 8 hours comfortably. Also: I subscribed to the base-level Spotify account and have found myself dancing at my desk. I’ve loved this change of pace and don’t see myself returning to a seated desk any time soon. Hi guys, thanks for this post! How is the height for you on this DIY desk? I only ask because it looks like it might be a bit low– that you might still be craning your neck downward to see your monitor. If not, then great! But if so, you might want to consider an adjustable height desk so that the height will be JUST right– whether you’re sitting or standing. I use one and recommend it to anyone– it’s a Nextdesk. They make standing, adjustable height, and even a treadmill desk coming soon. I’d really check them out if you’re looking for a more permanent solution!